Regina is a recently renovated family-run hotel in the Ötztal Alps, a starting point for hiking trails. 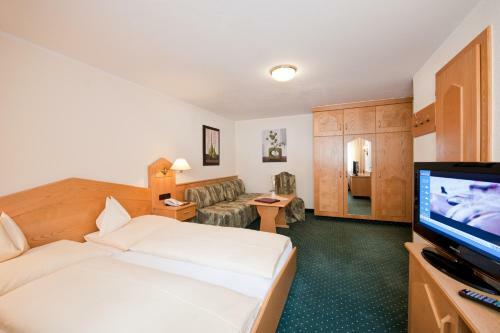 It offers elegant accommodation with ski-to-door access and a ski school with equipment hire. Free WiFi is offered throughout the property. Fitted with light wooden furnishings, bright rooms at Hotel Regina all open out onto a private balcony. Each includes a lounge area with couch, a modern TV set and a spacious working station. Typical specialities from Austria’s Tyrol Region are served at the restaurant (except on Wednesdays) of the hotel, while a bar provides drinks and popular local spirits. Obergurgl’s lively bars and eateries and just a brief stroll away. Guests can work out in the gym or play a tennis match at the court opposite the property. The in-house spa centre is decorated with a mountain-theme. Treatments include steam bath, hot tub and massages. Free private parking is available on site. There is also a private underground car park available against a fee. From late May to mid-October, the Ötztal Premium Card is included in the rate. This card offers many free benefits and discounts, including free use of local cable cars and buses.